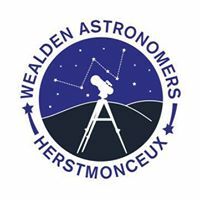 Wealden Astronomers are at the Observatory Science Centre, Herstmonceux this morning Friday March 20th from 7:30AM for the Partial Solar Eclipse. Weather permitting. However, if you are not an early bird, then there is always tonight for the the BBC Stargazing Live open evening, and again tomorrow night Saturday 21st March from 6:30pm - 11pm. As usual viewing is subject to weather permitting. We hope you can join us.